Remember, you can ask guests to bring some of these! Most people will ask what they can bring anyway. You can have a fun Fourth of July meal without too much trouble. A few years back we started a tradition of having a shrimp salsa appetizer for the Fourth. We love it! Combine 2 or 3 jars of salsa, a can of drained Green Giant niblets corn, and a can of rinsed and drained black beans. Finally mix in some small sized shrimp (inexpensive salad shrimp work well) and serve with tortilla chips. It’s amazingly good for something so simple. Keep chilled until serving time and put any leftovers back in the refrigerator. It makes a great midnight snack! For Fourth of July, I like burgers and hot dogs as much as the next person. But it’s nice to mix it up a bit some years with some yummy bacon-wrapped chicken kebabs and veggie kebabs. You can use any kind of vegetables you like, including onions, mushrooms, peppers, carrots, zucchini, yellow squash, and cherry tomatoes. Pineapple chunks, green peppers and onions work well on the same skewer as you can see in the photo. Many times it’s easier to cook the veggies in a grill basket and just do the chicken and bacon kebabs on the skewers. You can thread the bacon strips around the chicken chunks that way. Also you can keep the veggies separate for any vegetarians at your party. If you are using bamboo skewers, be sure to soak them in water before using. Click here for the directions at All Recipes. 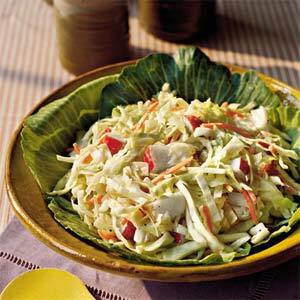 Lemon Apple Cole Slaw is a refreshing side dish that can be made with pre-shredded cole slaw mix you can buy in a bag. Just add the apples and lemon dressing for the perfect compliment to the meal. Recipe from Southern Living. Or use your favorite salad dressing to be an almost instant salad. “Doctored-up” Baked Beans have a place at every 4th of July get-together for my family. This recipe is a combination of recipes and tastes so much better than straight from the can. 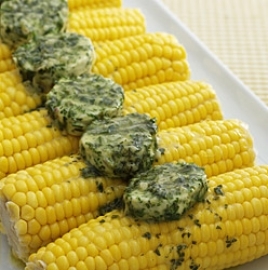 If you grow basil, serving it in a herb butter for corn on the cob is a great way to use it. You can serve it on the side if you like. I like the linked recipe for basil butter because it also works as a way to freeze fresh basil to use on all sorts of dishes year round. Click here to link to a post with a great way to make “Cooler Corn” on the cob for a crowd, an American Flag Sundae, and inexpensive decor for a 4th of July celebration. This menu is fairly inexpensive for such a feast, and if you make it potluck it’s even more reasonable. 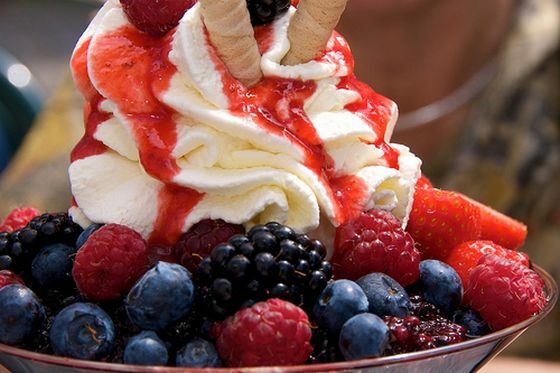 Click on the tag “Fourth of July” below this post for more ideas for crafts and recipes. BONUS: One of my favorite recipes (and very popular here on Square Pennies) is the Fourth of July Trifle that you make ahead of time. The red, white, and blue layers look pretty, and the taste and texture are wonderful. It takes a little bit of time to make, but it’s easy. The best part is that you can just set it out on the buffet and let guests serve themselves! I get asked for this recipe every time and there are never any leftovers! Click here for the recipe. I agree. Why not let that bacon flavor cook right in? Thanks for stopping by, Paula! Mmmm, bacon-wraped kabobs sound delicious ….